Thread: Thinking of getting an older specialized big hit for dh, any advice? Ok so I've been looking into a downhill bike for snow summit and stuff. I'm not sure I want to spend 2000+ on a 2 year old t.o.t.line bike yet, but for me it's either get something that's less than 500, older and acceptable, or just go nearly brand new. Nothing in between. He said it was tuned up recently as well. 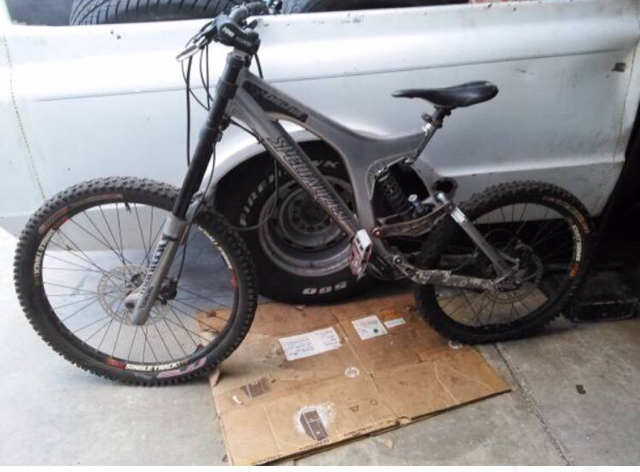 From what I've heard about this 2006-07 model is that it has a 24 inch rear wheel. Is that like really wierd for today's standards? I like jumps and technical sections, but also like flying down the hill and would like to have some decent grip as well. Will this bike still do the trick? Last edited by SHIVER ME TIMBERS; 05-20-2016 at 11:30 PM. I know, i know. You would think someone who has been a member here for over 12 years and has almost 47-thousand posts would actually know something about bikes, but you'd be wrong. It's okay, lots of people make that mistake. OP - There are 9 speed stuff still available, it's just not as much selection as 10 speed, and they don't make top tier stuff in 9 speed. It's all low to mid level stuff. As far as pro's and con's on that bike...you said you either had to buy a cheap sub $500 bike or a newer one for ~$2k. I would definitely go with the newer, more expensive option. Anything you pay $500 for is going to be old, and most likely beat to hell. You will start to break stuff and have to replace/upgrade, and your riding will progress quickly making you wish you had a better steed. If you drop more coin on a nicer, newer bike, you won't break stuff, and you'll be able to progress your riding without the bike holding you back. If you spend $500, you'll end up breaking stuff and upgrading and spend another $500 in a couple months. So you'll be $1k in the hole and still with a sub-par frame. My advice, spend the extra money. Sorry for the long winded answer, but I wish someone gave me this advice when I first got started. Or at least have heard of Google. XT/X7 9 speed rear derailleurs all over the place in the $50 range. there are no more 9 speed deraillers....Uhh...what? Need advice on a Specialized Bike i'm thinking about purchasing.